A plant that has adapted to survive in very dry environments. A plant that has adapted to survive in very dry environments. On the hot, arid island of Socotra, in the Arabian Sea, plants have developed different ways to survive long periods without rain. The dragon blood tree has waxy, upward-pointing leaves, on which small droplets of mist condense. The droplets then run down the tree's leaves and trunk, so they can be absorbed by its roots. Another example is the desert rose. It has a thick, bulbous trunk, which stores large amounts of water throughout the year. On the hot, arid island of Socotra, in the Arabian Sea, plants have developed different ways to survive long periods without rain. 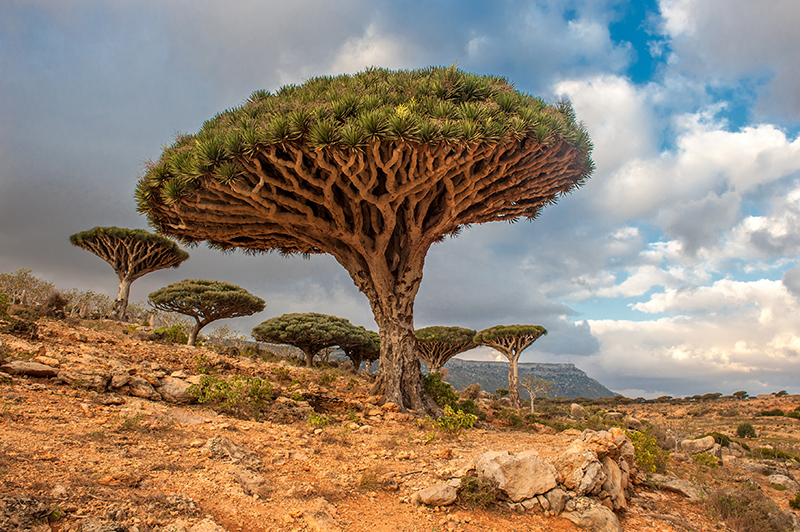 The dragon blood tree has waxy, upward-pointing leaves, on which small droplets of mist condense. The droplets then run down the tree's leaves and trunk, so they can be absorbed by its roots. Another example is the desert rose. It has a thick, bulbous trunk, which stores large amounts of water throughout the year.